A condition in my breeding is, and has always been, that the animals shall be completely healthy. It goes without saying that all my dogs are free from PRA and patella luxation. At the slightest hesitation whether the dog is sound or not, I have always chosen to give the dog away as a pet and not used it in breeding. It might seem harsh, but I have due to this, never suffered any diseases and defects in my breeding. Another guiding star for Kennel Caratoots is my saying “You can’t live with a beautiful fool”. I consider the mentality immensely important, since we have our dogs around us day and night. At Kennel Caratoots there are no special living arrangements for the dogs, they are just ordinary family members. I have also concentrated hard on obtaining anatomically correct dogs, a prerequisite for the dog to have a happy and healthy life. A sound constructed dog get a nice neck and top line, together with a wonderful movement and correct tail set. A typical papillon from Kennel Caratoots has completely spotless legs, and a mainly white body. Still after more than thirty years of breeding, there has only been very few dogs without a proper blaze, a quality I consider important to get the resemblance to a butterfly. improve and what flaws I want to avoid. Before deciding on sire and dam, thorough research into the lineage of the proposed parents is made. Pedigrees, health documentation, photographs etc are studied closely, and if the sire to be used comes from an external kennel, thorough discussions are held with the breeder. The same goes when other breeders want to use my dogs in their breeding. All my puppies are born and live their first five to six weeks together with their mother in the privacy of our bedroom, so that we can keep an eye on them at all times. When getting older they move into a puppy pen with the rest of our dogs, so to train them socially with other dogs. We are very close to our puppies and handle them often to eliminate socialization problems later as they mature. 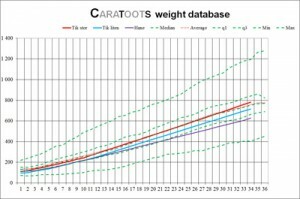 The puppies are examined every day, and their daily weights are entered into my weight database, where I have kept track of puppy development since 1999. We also take a lot of digital pictures during the puppy’s growth, to be able to compare the puppy with previous litters. Considering the development in weight and looks, I am usually quite good at predicting what the puppy will look like once grown up. Once the puppy is getting older and its characteristics and personality is revealed, I consider which ones to keep in my breeding program and which ones to sell. Even though many people have been waiting for a long time for a puppy from Kennel Caratoots, there is no queue. I regard it more important to find the right home for each puppy, considering its quality and personality. Once the puppy moves to a new family, it should be part of that family for many years, and it is therefore crucial that it comes to the right family. If the dog does not get on well with the new family, I demand the right to buy the puppy back. I value continued contact with the new family, so to see the development of our breeding. The family may of course always contact me for advice regarding their new family member. The puppy may move from its mother earliest at eight weeks of age. It is at that time vaccinated against distemper, parvo, kennel cough and if needed rabies. The puppy is also dewormed, id-marked with microchip, veterinary examined and registered with the Swedish Kennel Club. The puppy is always accompanied with a contract of sale, some food that it is used to and a blanket with scent of “home”. If sold to a Swedish speaking family, I also enclose our puppy handbook and a dvd + booklet from the Swedish Kennel Club with information on how to care for a puppy. All my dogs are fully insured to cover medical bills, so not to stop them for getting the medical attention they need incase of injury or illness. 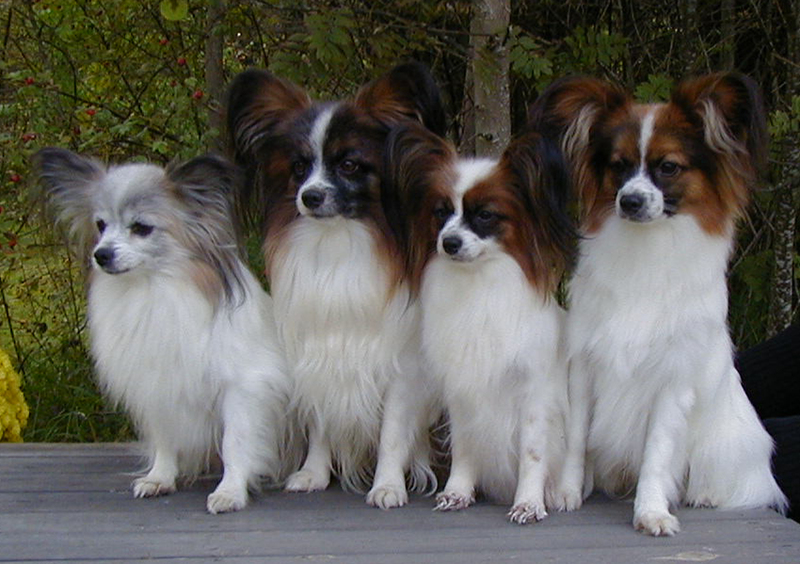 As member of the Swedish Kennel Club and the Papillon Club of Sweden, I also abide with the breeding rules and ethical recommendations issued by these organizations.